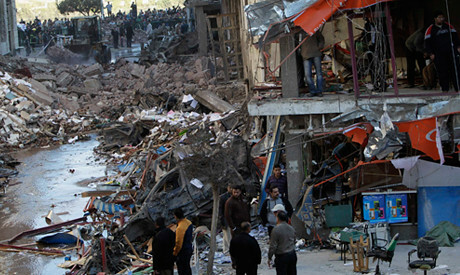 People looking at the damage from the Mansoura blast in the Nile Delta region. The attacks have prompted retaliation against the Muslim Brotherhood., a photo by Pan-African News Wire File Photos on Flickr. Residents of Mansoura have attacked property belonging to a member of the Muslim Brotherhood after a bomb attack in the city was blamed on the group. Fifteen people died and 134 were injured on Tuesday morning when a large bomb ripped through the Nile Delta city's security directorate. The city council building, a state-owned theatre, a bank and a number of police vehicles were also damaged in the attack. Interior Minister Mohamed Ibrahim claimed the attack was in retaliation for the violent dispersal of two pro-Mohamed Morsi protest camps in Cairo that left over 600 people dead in August. The Brotherhood has denied involvement in the attack. A building belonging to Abdel-Rahman El-Bar, a leading Brotherhood member, was ransacked by a group of angry locals, state news agency MENA reported. They removed furniture and threw it in a nearby stream. Hundreds marched at the funeral of 12 policeman and one civilian killed in the attack, AP reported. Following the funeral, local people torched the car of a man who made a four-fingered hand gesture indicating support for the pro-Morsi protesters killed in August. Crowds gathered outside the security directorate holding posters reading "No to terrorist groups" and pictures of army chief Abdel-Fattah El-Sissi. They chanted "The people want to execute the Brotherhood."